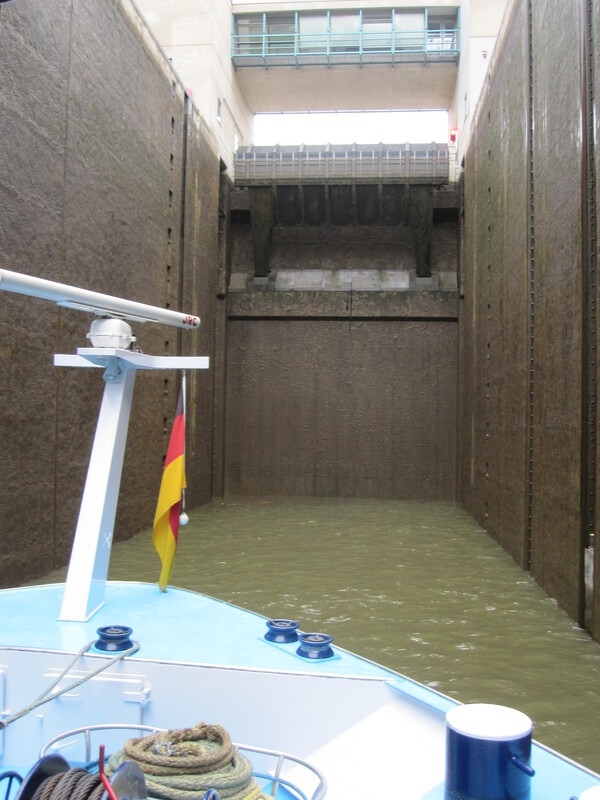 Our recent river cruise included an engineering wonder of the 20th century, the Rhine-Main-Danube Canal, also known as the Europa Canal. 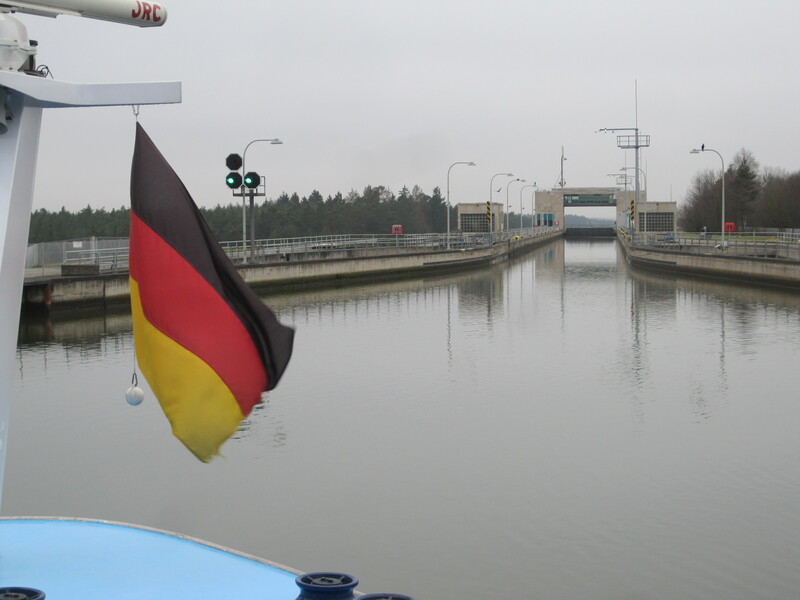 This 106 mile stretch of canal and locks makes it possible to travel or to ship goods by water from the Netherlands on the North Sea along the Rhine and Main rivers to connect with the Danube to go on to Romania on the Black Sea. The project was imagined as early as 793 C.E. by Charlemagne. Neither he nor Ludwig I of Bavaria was able to complete the project, but recent construction technology has brought their dreams to life. Completed in 1992, the system is a monument to imagination, perseverance and hard work. This map shows the entire route made possible by the Europa Canal. 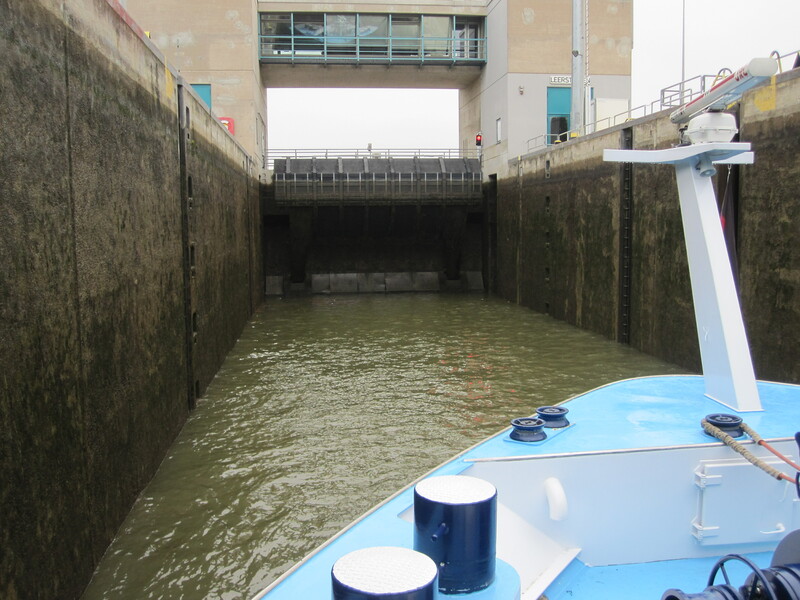 Here we are approaching the lock to drop to a lower level. Looking beyond the lock to a much lower canal ahead. We stopped well back from the red light. 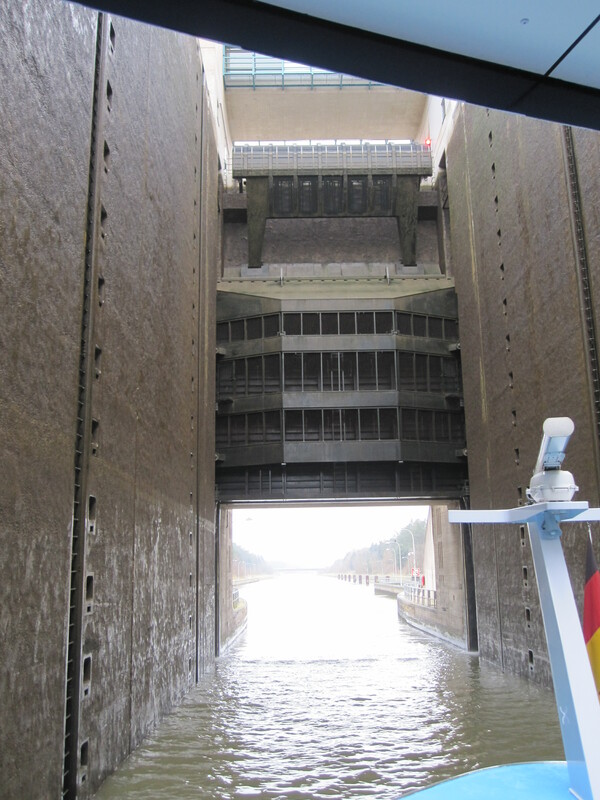 One of the problems which prevented success for Ludwig I was lack of water to refill the locks. Current engineering reserves water beside the locks, using water from one ship’s drop to raise the next ship. 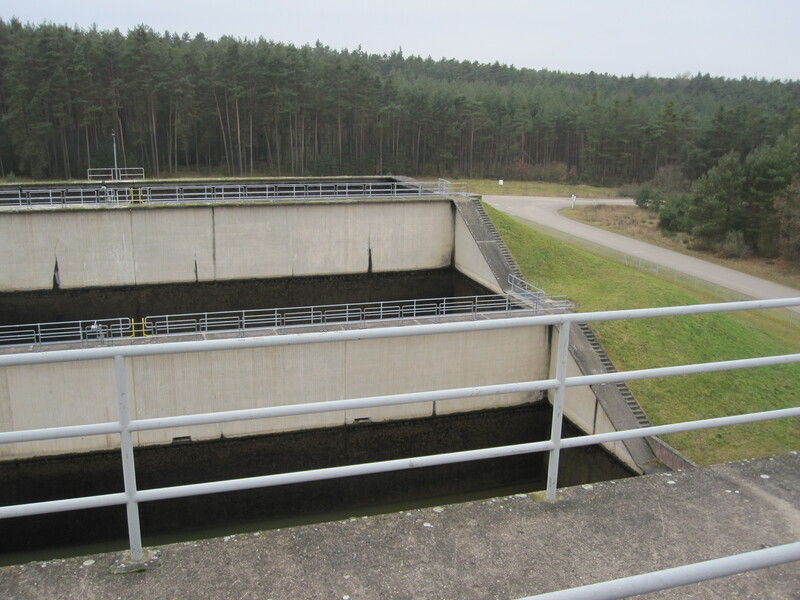 These reservoirs beside the lock retain water from our drop to use it for the next lift. Traffic through the locks is tightly scheduled for optimum use of the facilities. 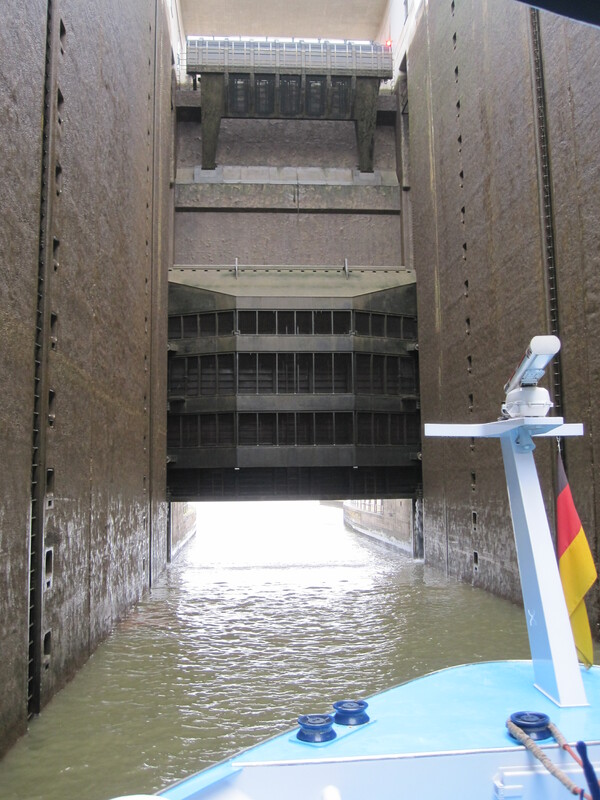 Some locks were very large, able to manage four riverboats or barges at once (two across, in two rows). 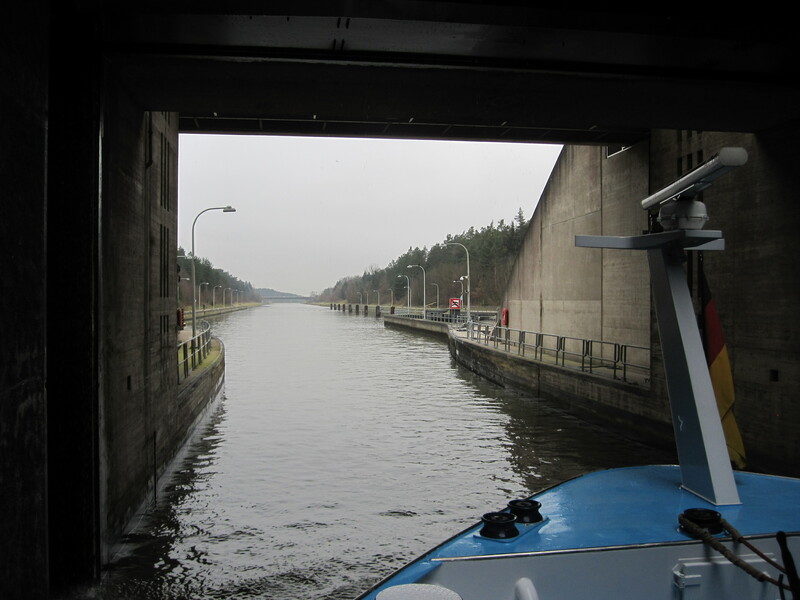 Other locks accommodated only one at a time; it was clear that the boats had been built to meet the smaller locks’ allowances. Here we are about halfway to our new lower level. Note how close the sidewalls are. 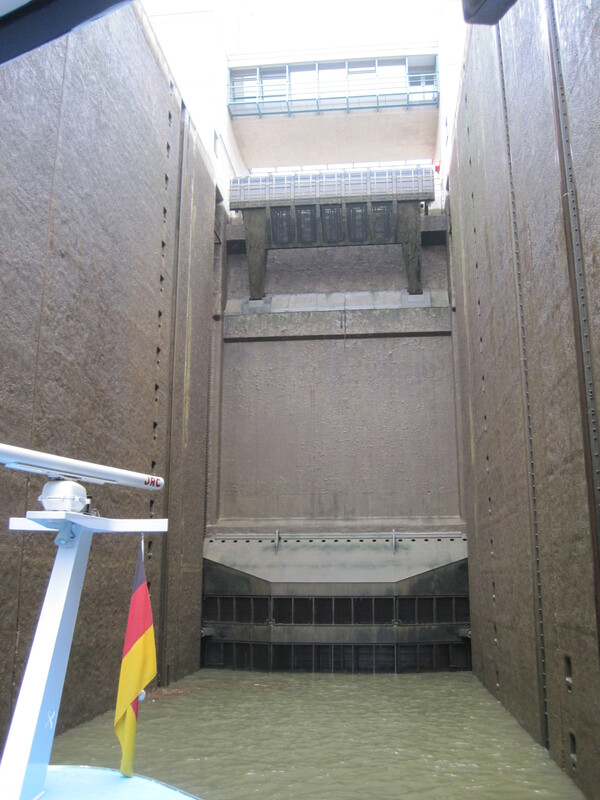 I had expected the gates of each lock to look like swinging doors, meeting at the center (Panama Canal style). But the lock I observed had a drop-down gate, clearly up to the task. The drains which let the water our of the lock become visible. Once the drop ends, the gate begins to lift. The gate is fully up now but the red light is still ON at the control level. Finally we proceed to the lower canal. Total time elapsed – about 30 minutes. Passing from the Danube river basin to the Main watershed entails crossing the continental divide of Europe. All passengers on the ship got a certificate confirming our “accomplishment.” I didn’t feel the exertion at all! 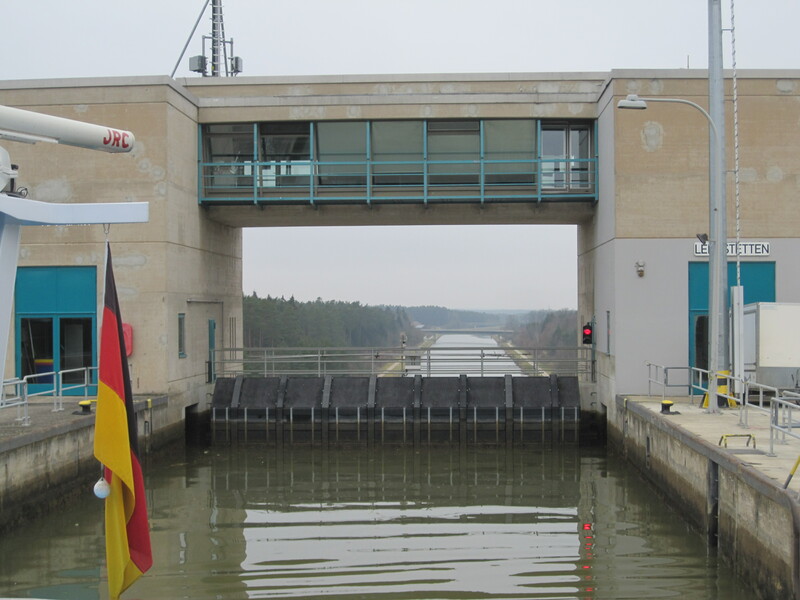 This entry was posted in Travel, Uncategorized and tagged Danube, Europa Canal, locks, Ludwig I, Main river, Netherlands, Nuremberg, Rhine-Main-Danube canal, river cruise, Romania, travel. Bookmark the permalink.